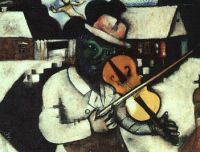 Celebrated modernist artist Marc Chagall (1887-1985), though born in the Soviet Union, spent much of his career in France. The Marc Chagall Museum in Nice has the largest permanent collection of his works, including his Biblical Message Cycle, comprising 17 large-scale paintings depicting scenes from the Bible. The museum contains a dazzling array of paintings, sculptures, stained glass windows and mosaics and the vivid colours and dreamlike quality of Chagall's work make the space come alive. It is a truly well-designed museum which captures some of the joyful quality of Chagall's work even though it is simple and small. Interestingly, Chagall himself positioned many of the works, as he was alive when the museum was built, and this goes some way to explaining how well everything seems to fit. There is a great film on Chagall's life running at the museum and it is really worth watching. One can also listen to audio recordings of explanations for each of the paintings and this hugely enriches the experience, particularly for those who aren't familiar with the artist. The museum has attractive gardens to wander in and a small cafe for refreshments.